I started writing this post over a year ago and it is one of many posts that I have stored on my computer that I’ve started and never finished. Today as I was reading this I realize that a lot has changed since I wrote it so I decided maybe it was time to finish it. When my kids were little we had a dog named Bandit. When we first got Bandit my kids were very young and he was a puppy. You could pretty much figure that wherever the kids were that is where you would find Bandit. If they were playing outside he was outside playing with them. When they went to school Bandit would walk with them to the bus stop where he would wait with them until the school bus came. After the kids got on the bus he would chase the bus down the road as fast as he could run until the bus would eventually outrun him and then he would turn around and come back home. In the afternoon when it was time for the school bus to return with his kids he would start waiting on the front porch about 15 minutes before it was time for them to be home. When he heard the bus coming he would gallop happily down the road to greet them He would be so happy they were home and they would be happy to see him. He would then hang out with them the rest of the day. No matter what they would be doing he would be right there in the middle of it all. Baseball games or running along side of them riding their bikes. He was part of the family and one of their closest friends. As the years went by the kids grew up and the school bus was replaced by cars and the little kids grew into teenagers. During that time our whole family had very busy lives. The kids were involved in school activities and sports and they spent a lot of time away from home doing things that teenagers do. No matter how busy we were every time anyone came home Bandit come running to greet them. Sadly the kids didn’t play outside with him to much anymore and it seemed like a lot of the time the most attention he got was a quick pat on the head as they were passing him on their way in or out. Bandit loved those small scraps of attention and it did not matter how much or how little attention he got he would always be happy to see his kids and he would always greet them with excitement. Bandit was truly one of the most loyal friends anyone could ever have and he loved everyone just because he did. I look back on this now and it seems sad though Bandit always seemed like a happy dog. My kids are all grown now and Bandit passed away a long time ago but for some reason today I was thinking about Bandit. Thinking about him got me to thinking about friendships and about how Jesus is my friend. Jesus is the most loyal friend a person will ever have and sadly I will have to admit that just like Bandit there are days he gets only small scraps of attention. Some days I have been guilty of hitting the ground running the minute I opened my eyes in the morning and then rushing through my day. There are days that maybe a quick “thank you for this meal” before dinner is all he gets. Yet he will still be there every single day loyally walking beside me ready to give me all the time I want with him, should I choose to want to hang out with him. I am not sure that I am quite as loyal of a friend as Bandit or Jesus in that sort of situation. I know what it is like to be someone’s last choice. I have been the last choice friend a time or two in my life and the truth is I have totally swung the whole scrap of attention thing the other direction. If I get the slightest inkling that I am the one pursuing the friendship all the time and I am never being pursued that’s when I decide I am not needed anymore or that I am being a pest and then I just quietly go away. I don’t want to make Jesus my last choice friend. I know I should treat others in the way I want to be treated, so why don’t I do the same with Him that I want others to do with me? That is where I left off writing last year. When I started this story a year ago though I was recognizing that I should put Jesus first in my life, I was still not always making Him my top priority. At that time I was also going through a rough patch with illness and pain and depression. Some days I smiled on the outside while I was crying inside. I remember wanting to hide how I felt from everyone yet at the same time I just wanting someone to know and to contact me, but how could they know to contact me if I pretended I was good? Through it all Jesus was there the whole time trying to make contact with me. He never gave up and usually always succeeded in one way or another to get my attention. A lot of time he would come by way of another hurting person and somehow some way I would see him there. Over time I realized that instead of running from him in my time of need that I needed to run TO him. The more I ran to him the more I realized I don’t want to just throw him a scrap of attention every now and then, I want him to have my first attention all the time. I was pretty down this past year but now I feel blessed by it all and this has been a truly life changing year for me. I can’t wait to see where the next year goes. 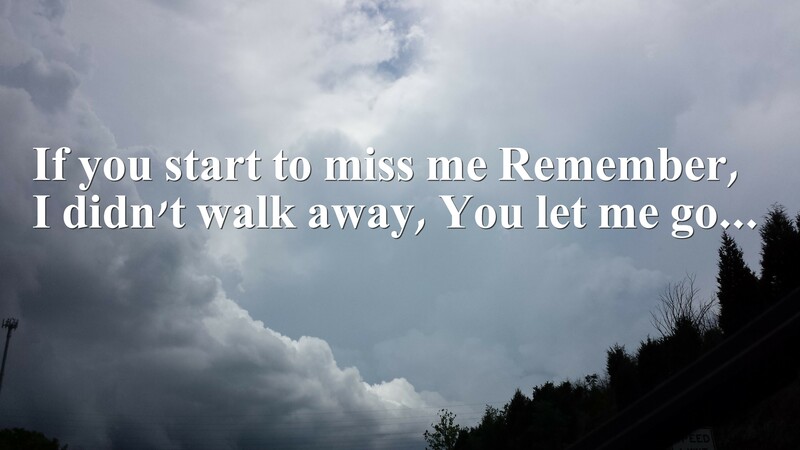 The quote above I see a lot on Facebook It says ‘If you start to miss me remember I didn’t walk away, you let me go’. In our friendship with Jesus we do have the free will to walk away if we want to, but I think once a person has let him in their life he won’t ever walk away from them. He doesn’t move away, if anyone moves away in the relationship it is us. Jesus is the best friend I have ever had and I am so thankful that on the days I ignored him he did not decide he was unwanted and make the decision to go away. He is a loyal forever friend and instead of leaving He kept pursuing our friendship even more. Even in my darkest days He was there breathing light in my life. He had claimed me as his friend and I am so thankful that I claimed him as mine. I often think God gives us dogs to mirror our relationship with him, just as you’ve described here. Great post. I am thinking he gives us a lot of things to mirror our relationship with him. At least that is what keeps happening to me a lot! Thank you so much for reading and your encouragement. Thanks for his Terri, always on time, I too have been feeling like this, somehow disconnected, but over the last few days and at church God has been speaking to me through messages etc, and this is one of them, thanks for this it just the icing I needed, and I know he does mirror our relationship like sueannporter stated above. I also notice on the days when I give him the scraps of my attention because like you I’m too busy, I find that is when satan takes control or try to. Really appreciate this and thanks for keeping me on track. I am so glad it was timely for you. and so glad you are seeing him speaking to you the way he has been, I love how he does that with us, he meets us where we are at a friend forever. Thank you for leaving a comment and for reading. Great story and a good lesson to all of us. I love His faithfulness. Thanks for sharing. This story about your Bandit reminds me of a dog we had growing up named Pedro. He did the same thing, always there greeting us at the bus. Thanks for the memory and of reminding us of our need to give Jesus our best! And thanks for the follow! There is a friend who sticketh closer than a brother………………………and remarkably, He calls us friends too. Yes he does 😀 sometimes I still am amazed that he would want to be friends with someone like me. Thanks much! Hi T, great story but I felt so sad for Bandit just scraps of affection, sadly that’s all some Children receive from their Parents too, they are so busy or preoccupied with their own activities. We have mostly adopted our Pets from Animal refuges or they have been strays so they come with baggage and our Mo-Joe has attitude but we love him and he is adorable but he can be very frustrating too. This morning once again he got out and away he went with me chasing him in my dressing gown and old pink slippers trying to catch him but it’s a game to him and when I get close he takes off again , it’s a worry because he has no road sense, anyway there we are at 5oclock in the morning playing catch me if you can, in the end I had to ask one of the older Children in the street to help me, I’m sure Mo-Joe was laughing at my embarrassment and exhaustion, the problem is he likes to be the boss after all I don’t have a tale or four paws, anyway God is helping me to grow in patience and long-suffering , how very blessed I am Lol! What you shared T about us walking away from God is True and our sin separates us from Him but heart repentance restores and we are in fellowship again but He doesn’t want just scraps or for us to be lukewarm, He tells us when we search for Him with all our heart we will find Him, He knows we need to Love 100% we were created in His likeness and He does. Very much a dog lover and animal lover in general, excellent expression ‘T’ God Bless!